Over the years, For Love of the Table has turned out to be a lot of things...some planned, some not. Always food, cooking and table related...but also covering a wide ranging array of topics. I have focused on basic techniques...and because I am always learning, I have also covered not-so-basic techniques. I have posted complicated recipes appropriate for a formal meal (from my private dinner service) or a weekend project...as well as things that were simply what I happened to be eating and enjoying at the moment. There have been many posts for foods so simple they don't really require a recipe. As for a theme...if you discount the fact that a preponderance of the posted recipes reflect my personal addictions to cake and pasta...I think it's fair to say that my blog is almost always about enjoying the abundance of each season. 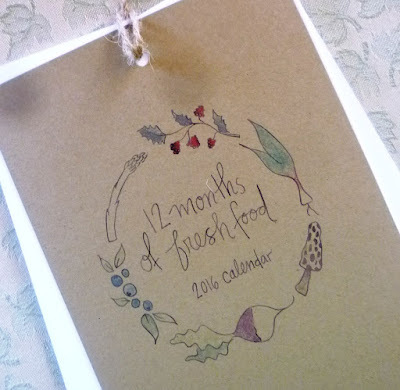 So this past Christmas when my good friend Bonnie gave me a handmade calendar (created and drawn by her daughter Johanna) that celebrated a single fresh food each month, I knew I had not only a lovely calendar, I also had inspiration for at least one post a month. 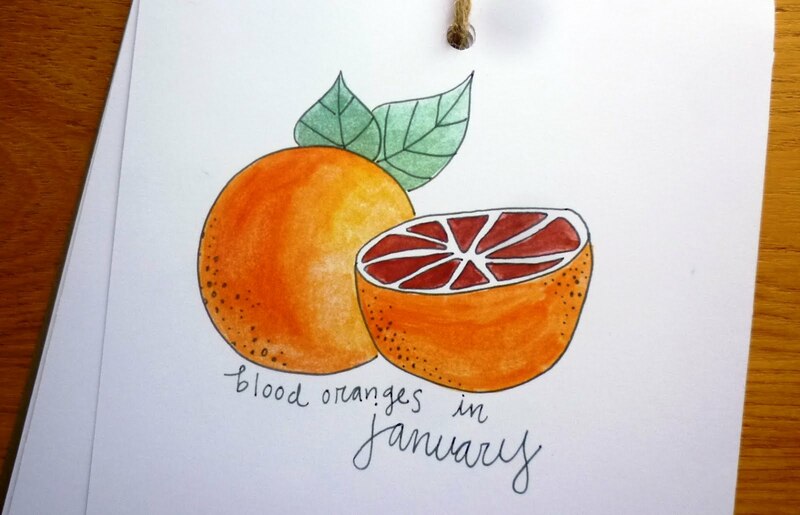 For January, Johanna chose blood oranges. What a perfect way to start the year! Blood oranges begin to trickle into the stores in December, but they don't really hit their stride and peak until January and February...finally tapering off in March and April. At a time of year when the bright and cheerful colors of the holidays have abruptly faded into the muted and sometimes depressing grays of winter, their brilliant red flesh is a welcome sight. 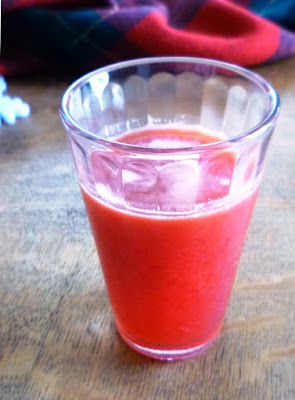 A glass of freshly squeezed blood orange juice will give the most ordinary breakfast a special feel. 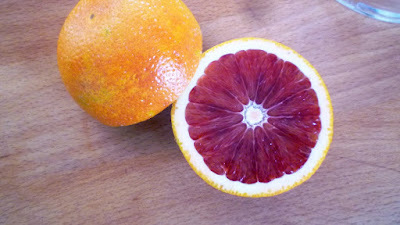 As noted above, blood oranges make wonderful juice. And they are also beautiful in desserts...tarts and upside down cakes being two places where they really shine. But I love them best in salads. You can use them in any salad where you would normally use a navel orange: with fennel...red onions....beets....avocado...olives....arugula....all manner of endives....pomegranate.....grapefruit and tangerines.... You get the idea. I posted a citrus, avocado and olive salad a couple of years ago that featured slices of blood orange. If you have never cut an orange into pinwheels or filets, that particular post includes some basic instructions on how to do just that. Today, I wanted to share one of my very favorite salads from Suzanne Goin's book Sunday Suppers at Lucques. 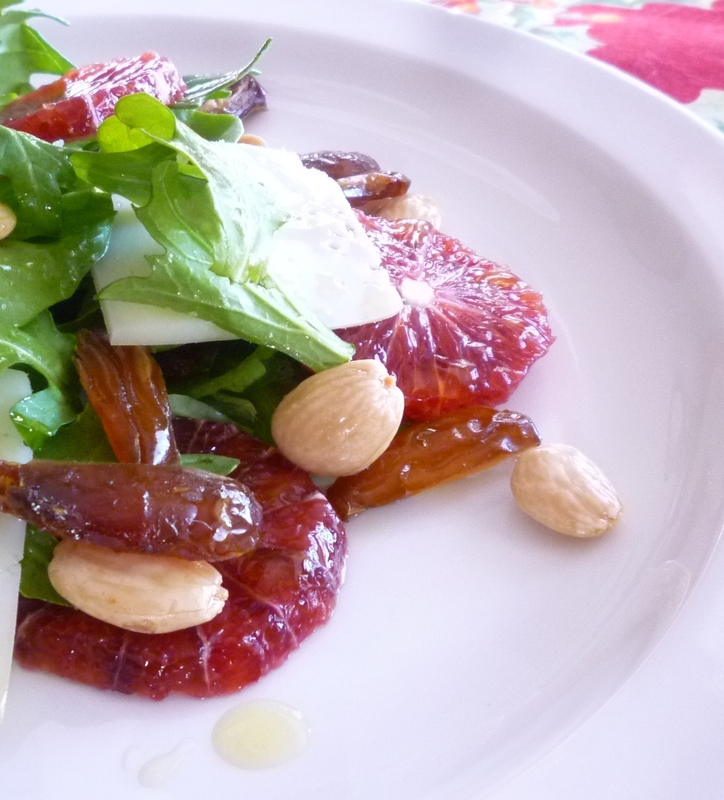 Goin created this salad as a showcase for the blood orange. This is one of those recipes that really isn't a recipe. As she points out, it's more of a tapestry....an artful arrangement of delicious and beautiful foods on the plate. Her recipe has a definite Italian feel....whereas my version is more Spanish, featuring Manchego cheese (instead of Parmesan) and Marcona almonds. You should feel free to alter the specific ingredients to suit your tastes...and your pantry. I was so inspired as I flipped through the beautiful drawings in Johanna's calendar. It is my hope during the coming months....as I occasionally share a recipe that features the ingredient she chose to represent a particular month....that you will be inspired too. Happy New Year. Cut the dates in half and remove the pits. If you like, cut the halves lengthwise. Slice the stem and blossom ends from the blood oranges. Place each fruit cut side down on the cutting board and following the contour of the fruit with your knife, remove the peel and cottony pith—working from top to bottom, and rotating the fruit as you go. Slice each orange thinly into 8 to 10 pinwheels, discarding any seeds that you find. Place the orange slices in a bowl and set aside. Place the Manchego, flat side down, on a cutting board. Using a chef’s knife, shave large thin slices of cheese from the chunk. If Deglet Noor dates are unavailable, use Medjool. Medjool are larger and softer….so use 8 and cut them in quarters or sixths (lengthwise) rather than in halves or quarters. Medjool dates are easier to cut when they have been refrigerated. In the original recipe, Goin uses almond oil. If you have almond oil, use it, otherwise, a nice Extra Virgin olive oil is fine. If you don't have Marcona almonds, simply use regular almonds, roasting them yourself. Spread the almonds on a small baking sheet. Place in a preheated 350° oven and bake until slightly darkened and fragrant. Set aside to cool.